How to Build a Goat Pen- Everything You Need to Know! You are ready to bring home your first goats! It’s such an exciting time. But, before you can bring your first goats home you need to build a goat pen. So how do you do that? What does your goat pen need? What kind of fencing does it need? What kind of housing? 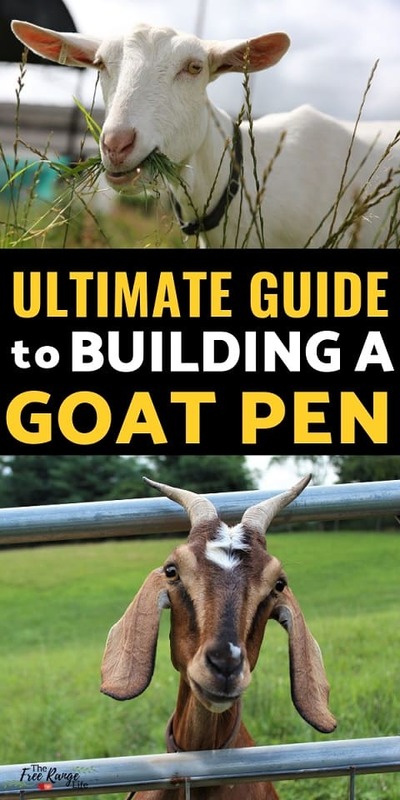 Let’s take a look at everything your goat pen needs to have in place and how to get it done! So the first step to building your goat pen is to decide on size. Like most animals, goat have minimum space requirements that their pen needs to have in order for them not to be overcrowded. So- your entire goat pen, including pasture and a housing needs to be no less than about 200-250 sq. ft PER goat. Than is the absolute bare minimum. You know you would feel cramped if you tried to fit your family of 4 in an 800 sq. ft. house and you were never allowed to leave that space! Goats are the same way- they want room to roam. So if you can build your goat pen larger- do so! 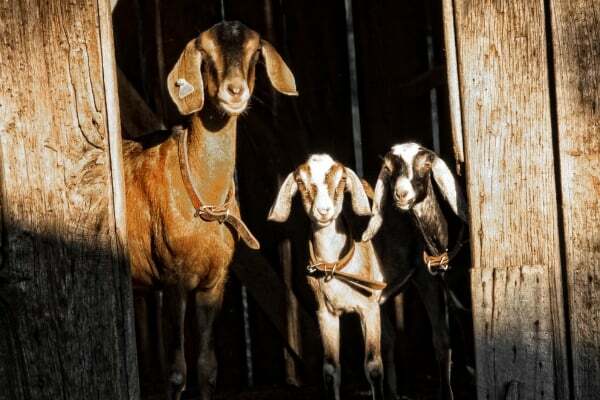 If you live on a small plot of land you can check out some of my suggestions on How to Raise Goats on a Small Lot. Next to shelter, fencing your new goat pen is top priority. Goats can just get into so much trouble! You need good strong fences around your yard. These fences provide 2 different things. One- they keep lots of predators out. And two- they keep your goats in. And if they are in their yard that means they are not in your garden, eating your landscaping or getting into toxic plants! A good fence is one that is strong, reliable and tall enough to keep your goats from jumping over. 4 ft high is the absolute minimum. Check out my guide on the Best Fencing for Goats or read my Ultimate Guide to Fencing on the Farm for more information on what makes a good fence for your goat yard. And don’t forget a gate! Now you have your pasture and fences, where will your goats live? Goats are pretty hardy, but your shelter needs will change based on where you live. Here in NC, we don’t have a ton of predators, so we have 3 (or 3 3/4) sided barns. None of our barns are completely enclosed or are able to be closed and locked. If you live in an area with lots of large predators you probably need to build barns that can close and lock tight. We do get a least a couple snow storms a year, so we do need strong roofs, and good walls to keep out snow, wind, and other elements. No matter where you live, this is necessary. They need a safe, dry, warm (ish) place to live. Now let’s talk about space. 20sq. ft. per goat is a good rule for the amount of indoor barn space to give your goats. Of course, there is some wiggle room here. If your goats have a large pasture and they really only sleep in the barn, then smaller will be okay. They will all huddle together anyway. But if you live in an area that gets a lot of precipitation, you will want to give them lots of indoor space without any overcrowding. Or check out these easy pallet goat houses! So what else do you need for your goat pen? Aside from pasture and shelter, you will need a few other things in your goat yard. First, a hay feeder. 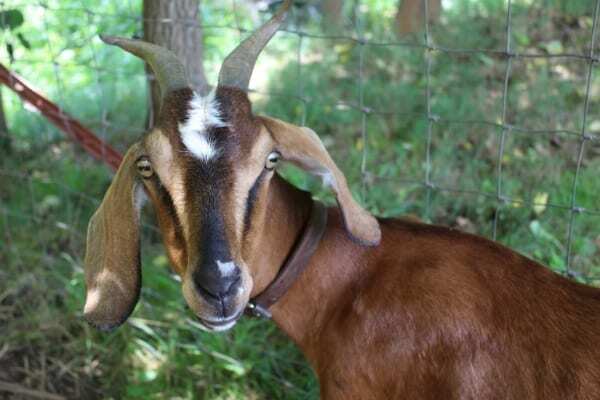 Your goats will need hay, even if they are on pasture, and more so in the winter or if they are in a small lot. So you need a good hay feeder. You can hang one in the barn or you can place a larger one in the yard- under cover. Hay feeders can be pricey- but you can check out how we made our own using recycled materials along with 5 other Pallet Projects for Your Goat Yard. Next, you will also want to make sure your yard has some shade. Goats need a place to get away from the hot, beating, sun. So make sure have some trees around- you might have to fence them to keep the goats from eating the bark and killing them! This goes without saying, but you also need a good source of fresh water in your goat pens. Either a large trough, a 5 gallon bucket, or an automatic waterer. Make sure they have fresh, clean water available at all times. And that is about it! You have yourself a goat pen and are ready to bring your goats home! Check out my Goat Resource Page to find out what other supplies you might need to have on hand to care for your goats! © 2018, Sarah R Toney. All rights reserved.